Where do I use my Hewlett Packard voucher code? Grab an HP offer from NetVoucherCodes. Follow the link to the HP website. Browse for electrical products you wish to buy. Add items to your basket then head over to your basket area. Click ‘E-Voucher’ and insert your code into the box provided. Select ‘Apply’ then ‘Checkout’ to finalise your transaction. Shop at Hewlett Packard for all the computer hardware and accessories you might need for your home office or your business. Here you'll find desktops and laptops scanners and printers, and supporting accessories such as mice, keyboards and headphones The HP store offers free delivery on all orders, and if your chosen items are in-stock you can expect to have them within 48 hours. HP provides support for various secure payment options, and their after-sales service will help you with queries and concerns you may have. Using a discount code from Hewlett Packard is a great way to get yourself a new laptop or printer at a discounted price. The codes offer a discount on selected items such as "10% savings available on HP Omen X Ultimate Gaming PCs" or "10% discount on Toners and Inks" Just enter the code when you reach the payment stage on the website and you will see an instant reduction to your final bill. You will find all the latest discount codes available from Hewlett Packard, here at Netvouchercodes, so be sure to check before you make a purchase. You're sure to find the laptop that perfectly suits your needs at Hewlett Packard. Their wide range includes notebooks and TouchSmart notebooks, gaming systems and workstations at prices to suit all budgets. Whatever your requirements are you are certain to find the laptop that is just right for you here. Hewlett Packard provides excellent levels of customer support and advice on all of their products. The HP Support System is an automated support tool that will help you to resolve and prevent any issues. At Hewlett Packard, you will find a great choice of printers to suit both the needs of individuals or of businesses. The range includes Inkjet printers, laserjet printers and large format printers, printers that just print or printers that have multifunction capabilities e.g. print, copy, scan, fax and photo. You'll find wireless printers and printers that need to be hardwired, black and white and colour printers. There are printers to suit all budgets here and if you check out our codes for Hewlett Packard, you find the right printer for you at a discounted price. Hewlett-Packard - also known as HP - are the world’s leading PC manufacturer. 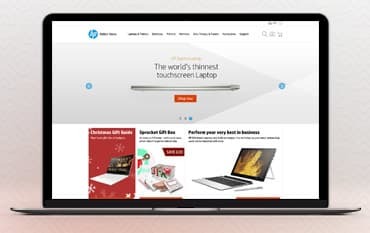 At the Hewlett Packard online store you’ll find all the computer hardware and accessories you could need for home and office, from desktops & laptops with warranty & support packages to scanners and printers to supplies, peripherals and accessories like mice, keyboards and headphones - all of which you’ll be able to get for less using our Hewlett Packard voucher codes and special offers.